Whatever you want to call them, they are crucial to any organization or business. Now more than ever, logos need to be functional across a variety of applications. Below you'll find a few of the final logos created. PDX Magazine - Provided with a scan of "PDX" in sumi ink, the image was refined into a vector format. Initial logo was used from the start. Later on it was slightly modified with the addition of more hand-drawn type. "PDX" and "Magazine" blending into one another asa representation of Portland being part of the magazine. Green Mart - New logo created for a cannabis dispensary. The logo was intently designed to broken up as needed. Several versions were created for various uses. The icon was specifically designed for use as a social media icon, and well as a useable design element in branding. The icon was also used as a router cut dimensional stand-off in the store location. Leafly.com rated Green Mart as #1 Cannabis Dispensary in Oregon 2017. Green Oregon - The client requested the use of a previously designed element; the tree in white. Any logo had to incorporate the tree. This solution was also designed with several versions for use on signage, window graphics and stationary. The tear drop could be used as a standalone icon for social media, or a design element. One-F Promotions - The client was specific on a simple, clean logo. Like other logos, this one included slight variations for various uses. In this case the icon, was designed with patterns in mind. As a music/event promotion venture, a logo pattern would make for a nifty back drop on stage. The icon also works well for promotional items like stickers, buttons, and other various uses. 710 Direct - Freedom of choice was the name of the game. Not knowing exactly what was wanted, quite a few different logos were provided to the client to choose from. Eventually, my very first napkin sketch (highlighted above) and subsequent finalized logo was the final choice. Once set on the logo, the same was true for the color palette. Exploring various colors the client settled on the above. Assorted Logos - Various logos and their respective variations for client use. 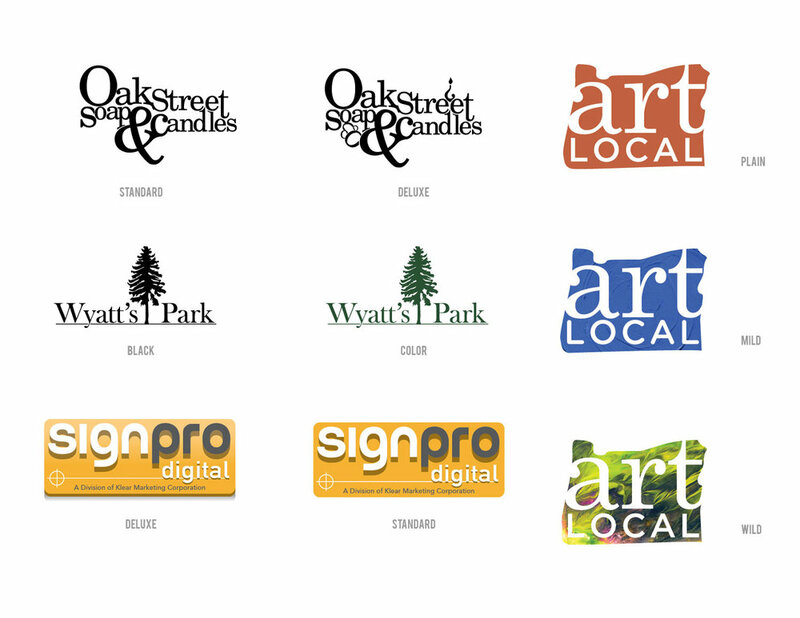 Oak Street Soap & Candles was a type-based logo reflecting the quirky, fun products that were produced. Wyatt's Park was created quickly for a new, upscale housing development. Sign Pro was a temporary logo, after the business was acquired by Klear Marketing. Art Local was created for promotional use by the Ford Gallery, and PDX Magazine. Three color variations were included.